Speaker: Imogen Hermes Gowar and competition winners. City Writes is an exciting new event created to showcase the best of City’s Short Courses Creative Writing talent. Readers are chosen from a short story competition open to all current and alumni students of City Short Creative Writing Courses. These competition winners will share the stage with a professional author from City's alumni and/or teaching body. 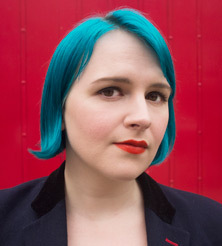 After a fantastic first year of events (you can read the reports here: Launch Event 2017; Summer Event 2017; Autumn Event 2017) we are delighted that our professional writer will be alumna, Imogen Hermes Gowar, whose novel The Mermaid and Mrs Hancock is among the most anticipated books of 2018 as noted by Vogue, Sunday Times, Observer, The Times, Sunday Mirror, Daily Express, BBC Arts, Red Magazine, Stylist, The Pool, Emerald Street, Independent, The Herald, Irish Times, Irish Tatler, The Journal and Irish Independent. The Mermaid and Mrs Hancock has also been included on the Longlist for this year's Women's Prize for Fiction. The competition winners joining Imogen are: Aliyah Kim Keshani, Sue Lovett, Rushiv Nayee and Kate Vine. Their stories will take us on a journey from hospital beds, back gardens and the blank canvas via existential crises. Refreshments: Wine, juice and water will be provided.